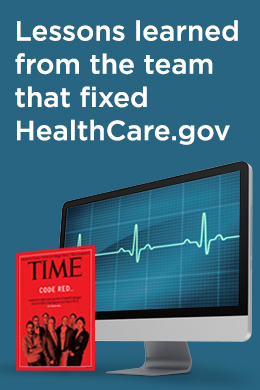 Four months after administrators of HealthCare.gov released details about the site’s technologically bumpy road to recovery, TIME magazine ran a cover story that gave a behind-the-scenes account of what exactly that journey looked like..
Coders and troubleshooters from across the country joined forces in Washington, D.C. to power-up the efforts to get the site back on track. Google site-reliability engineer and Obama campaign veteran, Mikey Dickerson, was responsible for stamping out bugs and speeding up response times. He and Jini Kim, a former Google product manager, relied heavily on the APM dashboard that was rolled out to everyone on the team to monitor the site and stay on the same page. Oh, my! This form is taking a long time to load! Maybe it'll complete in another moment, or maybe the script has stopped. The script, which loads this form, will sometimes break when an adblocker is enabled in a browser. Is it possible for you to disable adblockers or view this page from another browser? We apologize for this inconvenience. Are you using Firefox 42+ with Tracking Protection enabled? In Private Browsing windows (tabs, in Firefox for Android), Firefox may block this form from loading: learn about Firefox. These settings can be changed in Firefox > Preferences > Privacy. Just looking for a demo of New Relic? ©2008-19 New Relic, Inc. All rights reserved.